Lucknow: Over 100 passengers were rescued from the Lucknow Metro this morning as the first day of the new service turned hellish. 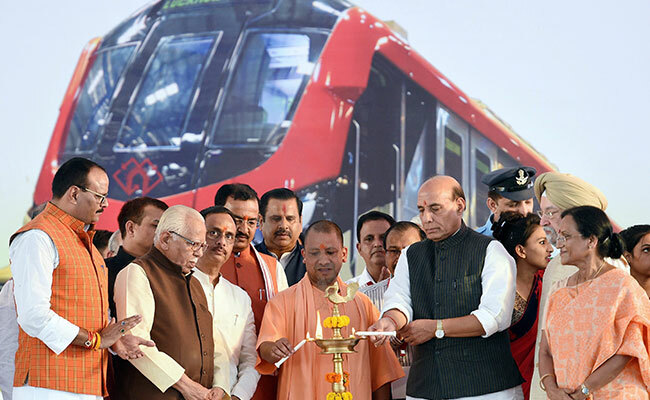 The new 8.5-kilometre city train was inaugurated yesterday by Uttar Pradesh Chief Minister Yogi Adityanath and Home Minister Rajnath Singh in presence of Governor Ram Naik and other officials of Lucknow Metro and State Government. According to press release issued by LMRC, “Around 7.15 A.M. today, a Metro Train that was on way from Charbagh to Transport Nagar developed a technical snag. The Emergency Brakes (EB) were applied in the train when the train was travelling between Durgapuri and Mawaiya Metro stations. All 101 passengers who were travelling inside the train were taken out through the emergency exit door of the train and were taken safely to Durgapuri Metro station. From Durgapuri Metro station, all 101 passengers were taken by a different train to the Transport Nagar Metro station. From the Transport Nagar Metro station all the passengers made in exit thereafter.